Michel Detay and Olivier Dequincey published a very nice article on Planet Terre about the basaltic lava tubes in Iceland. The article is illustrated with lots of magnificint pictures. Go check it out here. And while we're at it: Here you can find a beautiful gallery from Alexander Mustard of underwater rifts near the tectonic plates of Iceland. Lava tubes are natural conduits through which lava travels beneath the surface of a lava flow, expelled by a volcano during an eruption. They can be actively draining lava from a source, or can be extinct, meaning the lava flow has ceased and the rock has cooled and left a long, cave-like channel. Lava tubes are formed when an active low-viscosity lava flow develops a continuous and hard crust, which thickens and forms a roof above the still-flowing lava stream. Tubes form in one of two ways: by the crusting over of lava channels, and from pahoehoe flows where the lava is moving under the surface. Lava usually leaves the point of eruption in channels. These channels tend to stay very hot as their surroundings cool. This means they slowly develop walls around them as the surrounding lava cools and/or as the channel melts its way deeper. These channels can get deep enough to crust over, forming an insulating tube that keeps the lava molten and serves as a conduit for the flowing lava. These types of lava tubes tend to be closer to the lava eruption point. Further away from the eruption point, lava can flow in an unchanneled, fanlike manner as it leaves its source, which is usually another lava tube leading back to the eruption point. Called pahoehoe flows, these areas of surface-moving lava cool, forming either a smooth or rough, ropy surface. The lava continues to flow this way until it begins to block its source. At this point, the subsurface lava is still hot enough to break out at a point, and from this point the lava begins as a new "source". Lava flows from the previous source to this breakout point as the surrounding lava of the pahoehoe flow cools. This forms an underground channel that becomes a lava tube. A broad lava-flow field often consists of a main lava tube and a series of smaller tubes that supply lava to the front of one or more separate flows. 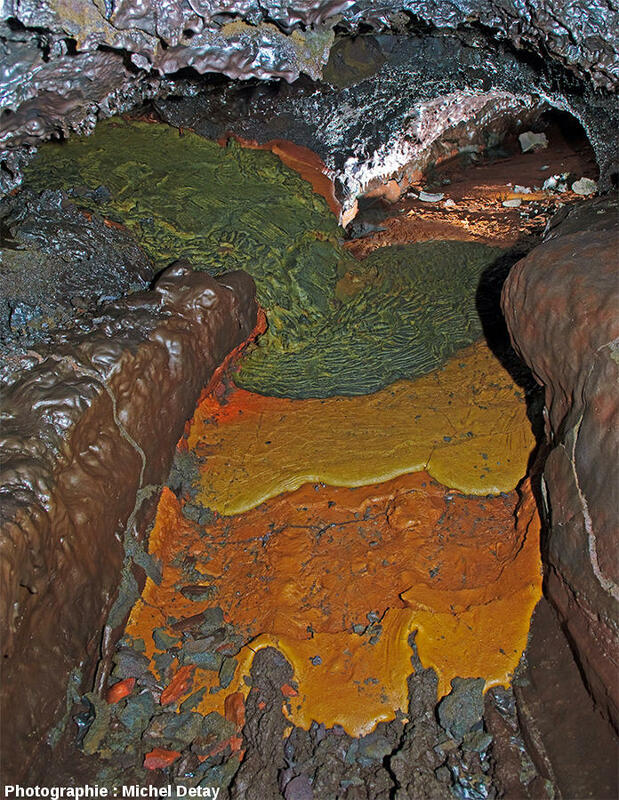 When the supply of lava stops at the end of an eruption or lava is diverted elsewhere, lava in the tube system drains downslope and leaves partially empty cave-like conduits beneath the ground. Such drained tubes commonly exhibit step marks on their walls that mark the various depths at which the lava flowed, known as flow ledges or flow lines depending on how prominently they protrude from the walls. Lava tubes generally have pahoehoe floors, although this may often be covered in breakdown from the ceiling. A variety of speleothems may be found in lava tubes including a variety of stalactite forms generally known as lavacicles, which can be of the splash, shark tooth, or tubular variety. Lavacicles are the most common of lava tube speleothems. 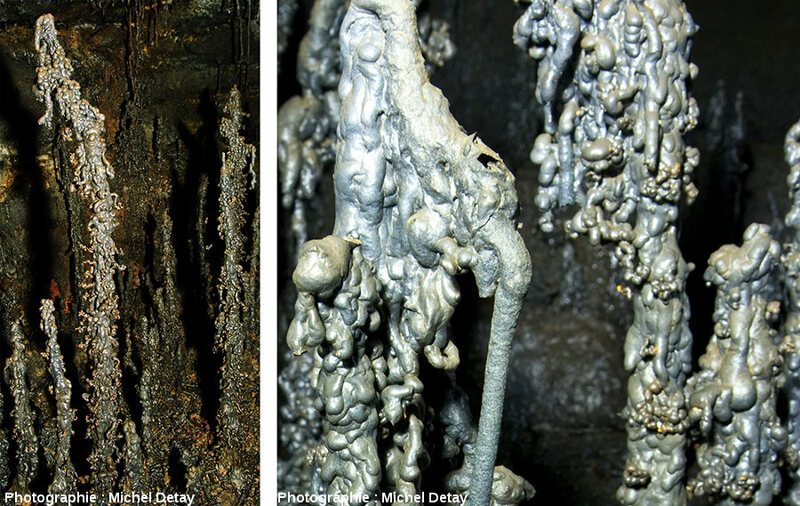 Drip stalagmites may form under tubular lava stalactites, and the latter may grade into a form known as a tubular lava helictite. A runner is a bead of lava that extrudes from a small opening and then runs down a wall. Lava tubes may also contain mineral deposits that most commonly take the form of crusts or small crystals, and less commonly, as stalactites and stalagmites. Lava tubes can be up to 14-15 metres wide, though are often narrower, and run anywhere from 1-50 m below the surface. Lava tubes can also be extremely long; one tube from the Mauna Loa 1859 flow enters the ocean about 50 km (over 30 miles) from its eruption point, and the Cueva del Viento - Sobrado system on Teide, Tenerife island, is over 18 km long, due to extensive braided maze areas at the upper zones of the system.